Finally, a comprehensive book on land conservation financing for community and regional conservation leaders. A Field Guide to Conservation Finance provides essential advice on how to tackle the universal obstacle to protecting private land in America: lack of money. Story Clark dispels the myths that conservationists can access only private funds controlled by individuals or that only large conservation organizations have clout with big capital markets. She shows how small land conservation organizations can achieve conservation goals using both traditional and cutting-edge financial strategies. Clark outlines essential tools for raising money, borrowing money, and reducing the cost of transactions. She covers a range of subjects including transfer fees, voluntary surcharges, seller financing, revolving funds, and Project Related Investment programs (PRIs). 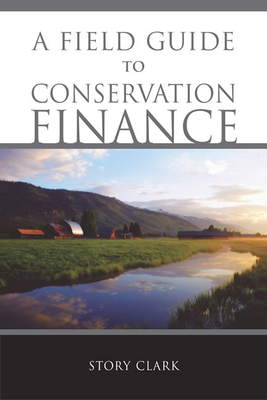 A clear, well-written overview of the basics of conservation finance with useful insights and real stories combine to create a book that is an invaluable and accessible guide for land trusts seeking to protect more land. Story Clark is a consultant specializing in land conservation strategy and finance, advising conservation organizations and foundations in the Rocky Mountain Region and elsewhere. She has worked in land conservation and land use planning for over 25 years in association with (among others) the Doris Duke Charitable Foundation, the Gordon and Betty Moore Foundation, the Jackson Hole Land Trust, and as a county planner for Teton County. Ms. Clark currently serves on boards or advisory boards that include: the American Conservation Association, Conservation International, Ruckelshaus Institute for Environment and Natural Resources at the University of Wyoming, the Nicholas School of the Environment and Earth Sciences at Duke University, the Wyoming Stockgrowers Agricultural Land Trust, the Tuckernuck Land Trust, and the Lady Bird Johnson Award Jury. She recently retired from the board of the Land Trust Alliance after serving two terms. She is a frequent speaker and instructor at land conservation conferences. She lives with her husband and two daughters on their family ranch in Jackson Hole, Wyoming. "A Field Guide to Conservation Finance sets a new standard for land trusts and land conservation. Story Clark has created a remarkable road map for linking passion for place with vital, sophisticated technical and financial skills. She shows us that the business of land conservation can—and must—be learned by anyone who is committed to passing the legacy of special places on to future generations." "This book belongs on the director's desk of every environmental group in the country: in it the fear of raising money is replaced by an understanding of what it means to give. Raising money is always about relationships, our relationship toward the land and each other. Who could imagine a book about money to be a book about love?" — Terry Tempest Williams, author of "The Open Space of Democracy" and "Refuge"
"Story Clark begins her wonderfully helpful book by noting that 'conservation finance is the best place where people, land, and money meet,' but it is surely not the only place. Her guide will help make the best place commonplace. If widely used, this field guide will keep all our other field guides relevant." "Without capital, land conservation is a tricky proposition, regardless of how altruistic intentions may be. The availability of funding is frequently the limiting factor for land conservation projects, but in A Field Guide to Conservation Finance, consultant Story Clark shows how to tackle this problem and successfully raise funds from private sources. Exploring both cutting edge and traditional financial strategies, Clark gives innovative advice to help land trusts and other conservation organizations achieve their goals. Based on her own extensive experience, research and countless interviews, Clark makes potentially daunting topics such as readying your organisation, approaching funders, using voluntary surcharges, and undertaking Project Related Investment programs (PRI) accessible. A Field Guide to Conservation Finance provides any savvy conservationist the financial strategies required to make his or her land conservation ideals a reality."